I’ve been reading The Hub Review a lot lately. It’s well written and he gets to see and review a lot of things that I would never make it to see. What initially caused me to finally bookmark the blog was his story about some audience misbehavior, something I have talked about in the past. The latest in audience misbehavior, or: Don’t make me use the cane! 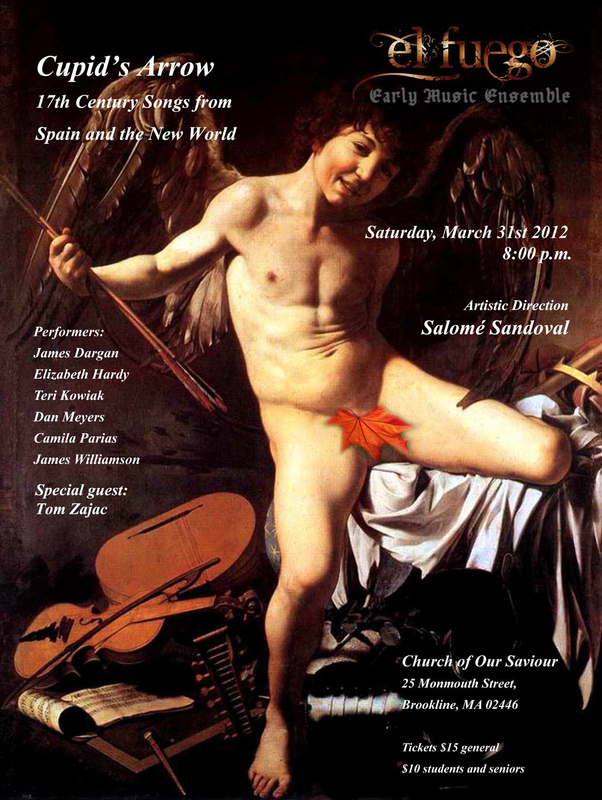 I was lucky enough to witness a truly wonderful performance by Boston Baroque on Saturday night – but it wasn’t so wonderful for everyone, at least not at first. Turning, I saw a sweet little old lady seated across the aisle, trying to get the attention of the gentleman directly behind me. Now I had sensed that he might be trouble – he’d hummed the opening bars of the first movement of Mozart’s Symphony No. 29, and then had wheezed softly on occasion after that. But I quickly realized that as I’d been sitting in front him, I’d been missing the true centerpiece of what had probably counted as an on-site interpretive dance. “Could you – excuse me, but could you please – ” the lady was continuing, even though she was obviously being ignored (he was softly wheezing again). “EXCUSE ME,” she repeated, more sternly, as she brandished it in close proximity to his stomach (the wheezing ceased immediately). “Thank you,” she added with a smile, setting her cane down again, but on the aisle – i.e., at the ready. A cane. Indeed, a tempting idea. At the end of the month of March there is a lot going on among my performing friends. I’ll update this list as I get more information as I know I don’t have all of it right now. From the always fabulous Margaret Angelini we hear news of the Boston Bach Birthday. It’s an all day, all Bach Birthday celebration of J.S. Bach’s 327th birthday. Admission is free, details are below. I’ve already mentioned the El Fuego concert which is happening on 3/31/12. 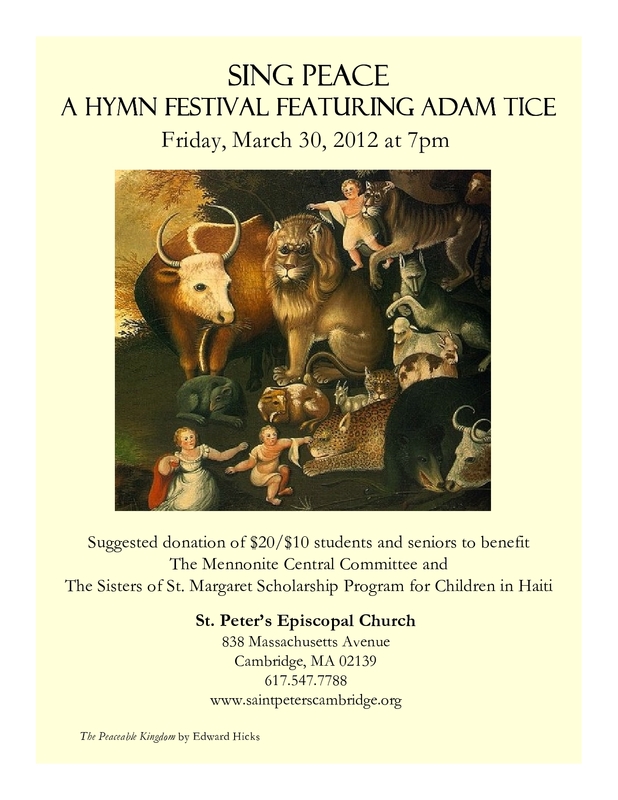 On Friday, March 30 at 7pm St. Peter’s Episcopal Church in Cambridge will be hosting “Sing Peace,” a hymn festival led by and featuring the hymns of Adam Tice (www.adammltice.com). Born in 1979, Tice is an extremely gifted hymn writer, pastor, and musician. He currently serves as Associate Pastor of Hyattsville Mennonite Church in Hyattsville, MD. Tice has two hymn collections, both published by GIA: A Greener Place to Grow: 50 More Hymn Texts (2011) and Woven Into Harmony (2009). Also, fourteen of his texts are in Worship: Fourth Edition (2011). Many of Tice’s texts focus on issues of peace and social justice, and these hymns will be highlighted in the hymn festival, along with a few spirituals as well. In conjunction with the themes of peace and social justice, a donation will be taken at the door of the hymn festival to benefit the work of two outstanding groups who work for peace and justice. Half of the donations will go to the Mennonite Central Committee who work for “relief, development and peace in the name of Christ” (www.mcc.org). You might be familiar with one of their partners found locally here in the area, the Ten Thousand Villages stores, one of which is located just down the street from St. Peter’s in Central Square. The other half of the donations will be given to the Scholarship Program for children in Haiti run by the Episcopal Sisters of St. Margaret (www.ssmbos.com/). This scholarship program helps to pay for the schooling of those who otherwise might not be able to afford the tuition costs. We invite you all to please join us for what will be a wonderful night of music making and supporting wonderful causes! The suggested donation is $20, $10 for students and seniors, but we encourage everyone to attend regardless of how much you can give, whether it is more or less! St. Peter’s is located at 838 Mass. Ave, Cambridge, MA, and is handicap accessible. The church is less than a five minute walk from the Central Square T stop on the red line. Please see www.saintpeterscambridge.org for more info or call 617.547.7788. And from Matthew Hall comes word of performances in April, some with Musical Offering. I will have the pleasure of playing the harpsichord solo in concerto #5. Hopefully none of these will require a cane.